BPM specializes in the general maintenance of shopping centers, malls, industrial parks, retail stores and office buildings. All services provided are offered 24 hours a day, 365 days a year. The convenience and dependability of our 24 hour maintenance is clearly a trusted favorite among our clients. Our quick response times and the willingness of our staff to go the extra mile have contributed to our success with countless satisfied customers. 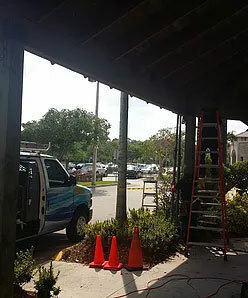 Our electrical team is committed to quickly assessing and repairing any electrical and lighting issues on your property. BPM possesses strong capabilities in electrical troubleshooting with timely resolution as a priority. We offer our clients routine inspections to ensure the property is maintained to our standards and expectations. Our visits include a visual inspection of the entire property. We proactively identify potential liabilities including: code violations, structural concerns, mold growth, parking lot issues, draining system deficiencies, dumpster areas, fences, traffic signs, and more. If any deficiencies are found, we will submit a report, including pictures and an estimate for the repairs. This knowledge provides the owners and management the information they need to make educated decisions about the repairs at hand. If an existing customer schedules an inspection for an additional property that is not maintained by us, we will be happy to waive all inspection fees if repairs are completed by one of our qualified technicians. Inspections are not provided to realtors and investors looking into buying a commercial property. See attachment for our sample report. For any questions or concerns please send an email.